Here’s my contribution for the week. It seemed all too appropriate based on this week’s topic. This is an older piece, but Muddy Waters the great blues performer fits the bill! With a name like that…you could not resist. Love the lines, and contrast. Very wonderful. Fabulous drawing. I wish I could do that! Go check in on Xtian (a couple thumbnails away) for some good music. Great! As soon as i submited my picture I thought, “Damn, I could have done Muddy Waters.” But it would not have been near as good as yours. 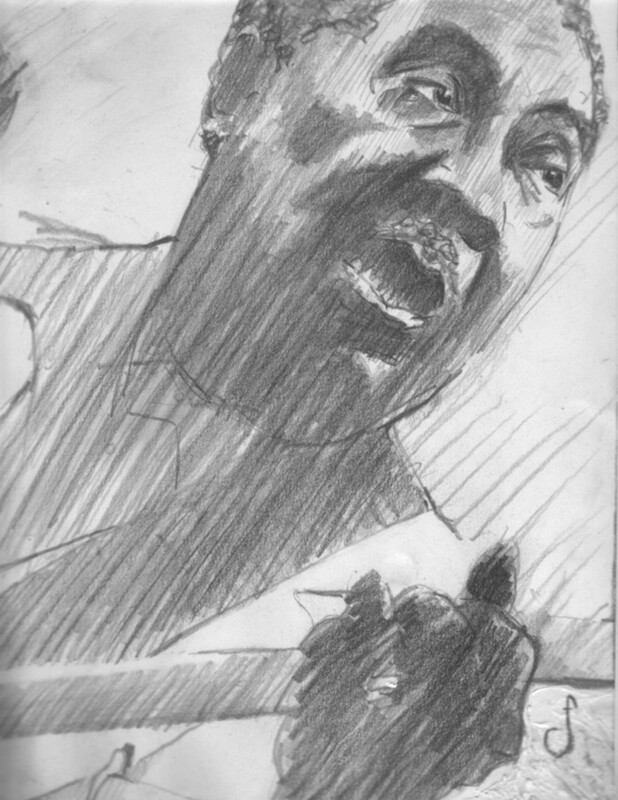 Excellent drawing of Muddy Waters…nice work. Such a strong piece. Fantastic composition, deliberate strokes. Great illustration. Strong vibrational piece, fits the man! Wow! This is gorgeous. I think you should do one of my universal favorite Af-Am BBop master genius musician: Thelonious Monk. Monk! Yes–that is a great suggestion! Live at the It Club is my favorite album of his. Think I’ll go with that one!